One hundred and seventeen days of waiting are almost over. 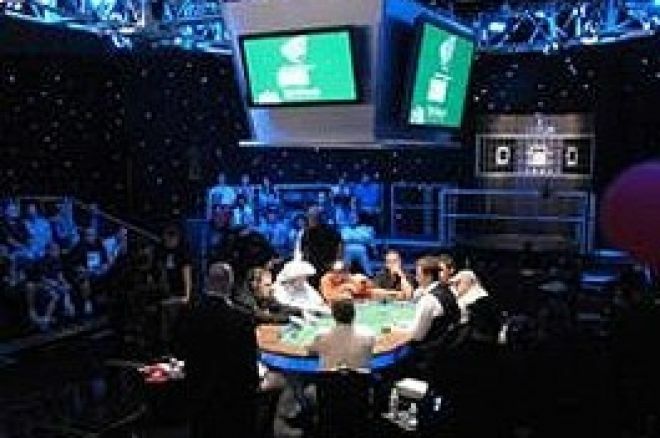 Beginning at roughly 10:20 a.m. Las Vegas time on Sunday morning, the nine finalists in the 2008 World Series of Poker Main Event will return to play in the Penn and Teller Theater within the Rio, amid a stadium setting filled with a couple of thousand friends and family and fans of poker. The cameras will be present as well, recording the play for a worldwide television audience, and the fastest live updates from the scene, as always, will be available right here in PokerNews' live reporting area. The final table of the WSOP Main Event is always poker's biggest annual happening, and as has been in the case in recent years, a player who was a relative unknown as the tournament began will wind up as poker's World Champion, with a $9 million payday and a life that will forever be changed. This year's tightly bunched final table offers no runaway favorite, but instead provides a rooting story for almost every type of poker fan. Whether it's the appeal of the "everyman" (as exemplified by chip leader Dennis Phillips), the come-from-behind underdog (short stack Kelly Kim), the Internet-savvy pros (Ylon Schwartz, Peter Eastgate, Craig Marquis), or any of a half dozen other themes, Sunday's final is sure to provide an interest mix of personalities and player types and, almost certainly, one or two surprises along the way. Dennis Phillips (Leader, 26,295,000 chips) – The 53-year-old Phillips, is by far the oldest player in this year's final, and his blue-collar background (he works as a manager for a St. Louis trucking company) makes him an easy player with whom casual players can identify. Phillips ran well late but showed no shortage of poker savvy in reaching the final with the deepest chip stack. Phillips has been visible with charitable causes as well, using his newfound fame (and with the support of sponsor PokerStars) to generate funds for such worthy charities as the Albert Pujols Foundation and the Multiple Sclerosis Society. Ivan Demidov (Second Place, 24,400,000) – Demidov was an unknown entering the final but will leave Las Vegas at the forefront of a double vanguard of poker's expansion – of the growth of European poker in general, but of the explosion of poker in Russia (and the success of Russian players) in particular. Demidov pulled off an amazing double this year by reaching the final table of the WSOP Europe Main Event in September, where he ultimately finished third. He'll have a chance to better that performance here. Demidov plays under the PokerStars banner. Scott Montgomery (Third Place, 19,690,000) – Canada is well represented at this year's final with two players, including the affable Montgomery, who remained as cheerful and outwardly carefree as any of the players as the final-table bubble approached. An aggressive player with plenty of online experience himself, Montgomery is among the biggest wild cards entering play. Montgomery has one edge most of his opponents lack, in having played at a televised final table before (2008 WPT LA Poker Classic). He'll be sporting Full Tilt gear at the final. Peter Eastgate (Fourth Place, 18,375,000) – As with Ivan Demidov, Denmark's Peter Eastgate represents the cutting edge of European poker – young, selectively aggressive, and very, very good. Eastgate, who's been picked up by PokerStars, shies away from comparing himself with established European stars such as fellow Dane Gus Hansen, and also professes that his trademark aggression is more a reaction to table conditions than a pre-set plan. He's the youngest of the final nine players, but certainly among the most dangerous. Ylon Schwartz (Fifth Place, 12,525,000) – Some players project cool and calculating personalities, while others seem to enjoy the moment. Schwartz definitely falls into the latter category, even if he does see his final-table appearance as vindication of his own skills and effort. Schwartz's path to the final mirrored his own unique road through life, where he began earning living money at age 13 as a chess player – for $50 or $100 a day – on the streets of New York. Schwartz, who often plays at PokerStars, would celebrate a victory in his own distinctive way, with an aimless sojourn through the south of France shared with good wine and better friends. Darus Suharto (Sixth Place, 12,520,000) – Virtually tied with Schwartz for fifth entering the final is Toronto accountant Darus Suharto, a native of Indonesia who took up poker in hopes of finding a profitable pastime to help pay down his home mortgage. Despite being an accountant and once working for the same firm as 2003 WSOP champion Chris Moneymaker, Suharto, who plays on PokerStars, laughingly admitted to not knowing who Moneymaker was until his own poker career was well underway. Still, in terms of poker and accountancy, Suharto's not that far away from seeing lightning strike for a second time. David "Chino" Rheem (Seventh Place, 10,230,000) – "Chino" Rheem may well be the pro players' choice to win, given the right betting odds, and his live-event experience exceeds that of most of the other players. Rheem's wild ride to the final left him low in the standings but with a still-dangerous chip stack, and he's shown no hesitation in wielding that stack effectively at opportune moments. The soft-spoken and articulate Rheem demonstrated plenty of savvy on his way to the November Nine, and there's no doubt he'll arrive at the final with three things – a PokerStars logo, a willingness to gamble, and faith in his reads and abilities. Craig Marquis (Eighth Place, 10,210,000) – Craig Marquis, who will represent Full Tilt Poker at the final, is another of the Internet success stories that have become a common thread of poker's modern age. Marquis's rise to success might well be a tale of "follow the money," meaning the money that friends David "raptor" Benefield and Tom "durrrr" Dwan were able to show off as a result of their own poker successes. Marquis took the hint, and soon also began taking down events, though none would be bigger than this. While each of the players had their own moments of fortune on the way to the final, Marquis' was among the most poignant, as he got the best of tenth-place finisher Dean Hamrick twice to return to the November stage. Kelly Kim (Ninth Place, 2,620,000) – One could easily excuse Kelly Kim for treating the final table as a freeroll, given his fortune in making the final on a short stack after collisions between Craig Marquis and Dean Hamrick left Hamrick on the outside looking in and Kim with one of the nine cherished seats. But while Kim – who will represent Full Tilt in the final – might be faced with a single move for his tournament life, expect him to pick that moment wisely. Kim's been faced with short-stack survival before and has some solid tournament results to show for it. And in terms of fans per chip, Kim has each of the other players outgunned: it's rumored he'll have a couple of hundred cheering supporters on hand, rooting him toward some early double-throughs and an extended run. As with each of the other players in the final, it'd make a great story. And there you have it. All nine finalists have collected over $900,000 in prize winnings already, and one of them will soon ascend to the pinnacle of the game, becoming poker's world champion for another year.